Whoever said gifts were only for your family and friends? Your home probably wants a little bit of loving this holiday season as well. Whether you’re an avid DIY-er, a new home owner, or you just moved into your first apartment, here are the top five gifts that should be on your list this year to show your home how much you appreciate all of its hard work. These clever little light bulbs will save you a ton on headaches and energy bills. This Starter Kit comes with two Smart Light Bulbs and one WeMo link, a discreet wall plug-in that allows you to control up to 50 Smart Bulbs with your phone or tablet. Turn your lights on, off, dim, or set timers and schedules so you’ll never have to worry about leaving your lights on and spending too much on electricity and energy. Moreover, these bad boys have a life expectancy of 23 years! This is a great handy-dandy tool for the DIY-er in your life. The Black & Decker Smartdriver comes with an exclusive magnetic screw-holder so you don’t have to worry about dropping screws while you’re working anymore. With a built-in work light, lithium-ion battery that will stay charged for up to 18 months, and a six-position clutch to prevent stripping screws, this is the perfect gift to complete anyone’s workshop! Have a stripped screw and no Smartdriver? Here’s an easy Fresh Fix tip for how to work around that! If you’re rocking that apartment life and don’t have the space to garden or keep high-maintenance pets, the Aqua Farm is perfect for you. This herb garden/fish tank combo is great for any small home or apartment and hardly requires any upkeep. It’s a perfect cycle: the fish waste feeds the herbs in the garden, the roots soak up water from the tank, and the plants keep the water clean. For the hapless gardener, the EasyBloom Plant Sensor can help you become the green thumb you’ve always dreamed of being. The flower head of the EasyBloom device measures the sunlight, temperature, and humidity of the air in your garden while the roots sample the type of soil. Plug it into your computer’s USB drive later and, thanks to EasyBloom’s database of over 5000 plants, it will recommend the best flowers, trees, bushes, and vegetables to plant in your area. No more trial and error gardening! It can be expensive and such a hassle to stock up a new kitchen when you first move. I know I lived off of two dollar-store plates, and hand-me-down soup bowl, and a few plastic utensils I’d ‘borrow’ from restaurants for the first few weeks of living on my own. To combat this, Bin Akebono created this fantastic and stylish all-in-one kitchen tool! 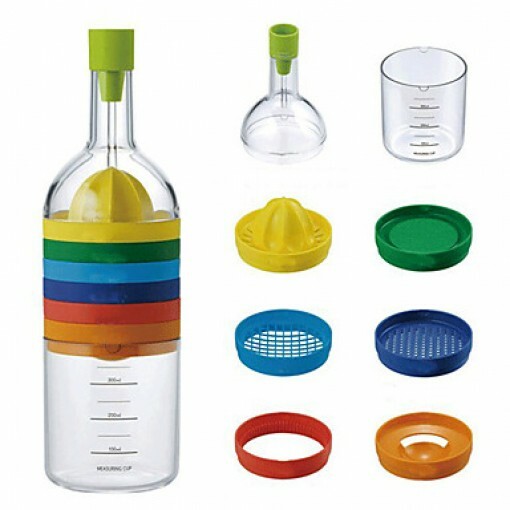 While it may just look like a bottle of wine, this tool is actually 8 essential kitchen utensils in one: a funnel, juicer, spice grater, egg masher, cheese grater, jar opener, yolk separator, and measuring cup! The perfect gift for someone just starting their life in a new home or apartment.